Objective: To deliver business support and efficiency savings, be a voice for local business and play an active role influencing the wider agenda. 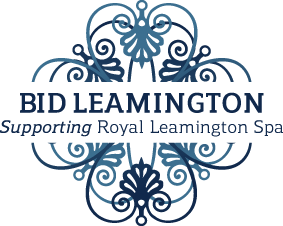 BID Leamington is committed to providing on-going support to the businesses within the town and influencing the future direction as the town develops. We recognise that your business’ success also means the success of Royal Leamington Spa, and vice versa, so it’s by working together and supporting each other that we can bring mutually tangible results. In support of businesses in the BID area, BID Leamington delivers 1:1 meetings, workshops, networking events, open meetings with guest speakers, and our “Toolbox Tips” via newsletters and this website. supported the new ‘retail sector’ representative at LEP Board level. An active founding member of the Warwickshire Towns Network. Provided bespoke support on issues such as business rates, planning and digital support to large and small businesses, and offered new businesses our ‘Business Launch Pack’ (available to anyone) which includes key business and media contacts, marketing tips, demographic information and launch event ideas. Monitored town centre health using footfall, parking and vacancy rate data. The town centre is performing better than other West Midlands locations and the vacancy rate is consistently below the national average. Defended the town against further unrestricted A1 out of town retail development. This included making representation at Council Planning Meetings and to the Planning Inspectorate during an appeal hearing. This work continues as further applications have come forward. The 600 space Covent Garden Carpark redevelopment in the town centre beginning in February 2019. The £1 million Heritage Lottery funded renovation of the Pump Room Gardens began in September 2017. BID is on the steering group. The District Council has now announced a development partner for the Old Town Cultural Quarter. Welcomed over 100 businesses to the ‘Place Part 2’ BID Business Meeting which started the consultation process for the new BID term 2018-23, Christmas Business Meeting and BID Launch Business Meeting. All aimed at informing businesses of the new BID Term and highlighting opportunities to get involved, swap ideas and find out about local issues. Active member of the Warwickshire Retail Crime Initiative, Retail Radio Scheme and Safer Neighbourhood Forum. Regularly monitored crime and reported activity on behalf of BID members. Monitored antisocial behavior and begging. We work in partnership with the Warwickshire Police and numerous local charities to tackle the issue of people begging and shop lifting. Worked in partnership with the District Council, Police and Musicians Union to monitor and develop policy and guidance on ‘Town Centre Busking’. Actively engaged with the District Council and County Council to ensure town centre car parking prices did not increase. Parking Angels were also deployed at Christmas. This work is on-going. Contributed to a strategic group to address issues around vacant units in partnership with Invest Warwickshire. Contributed to an update to the town planning / shop signage information brochure and provided advice to a number of businesses. Further developed the Business Toolbox in the BID Newsletters and on the BID Website. Welcomed 39 new businesses into the town throughout the year and offered them the ‘New Business Launch Pack’ (available to anyone) which includes key business and media contacts, marketing tips, demographic information and launch event ideas and key contacts to invite. Monitored town centre health using footfall and vacancy rate data in the town centre. The average vacancy rate in the BID area is currently 3.9% which is half the national average and 1.3% less than last year. Continue to represent business interests in respect to managing the impact of proposed new development in the town centre. In the past year the District Council has announced plans to develop the 600 space Covent Garden Carpark in the town centre, as well as a significant area of land including the Pump Rooms and part of the Old Town. This work is ongoing. Worked to successfully defend the town against further unrestricted A1 out of town retail development. This included making representation at Council Planning Meetings and making representation to the Planning Inspectorate during an appeal hearing. This work also continues as further applications have come forward. Welcomed around 50 businesses to the ‘Prepare for a Cracking Christmas’ Open Meeting in October 2015 and the ‘Love Leam’ Business Connect Meeting hosted at Deasil in partnership with the Chamber of Trade in March 2016. The aim was to connect businesses, highlight opportunities to get involved, swap ideas and find out about local issues. Activity monitored antisocial behaviour and begging and helped relaunch the campaign to address these issues. Now called ‘Think Before Your Give’ we work in partnership with the Warwickshire Police and numerous local charities to tackle the issue of people begging. This includes public engagement, the production of posters and flyers as well as providing advice on responsible ways to help vulnerable people. Since relaunching we have seen the numbers of people begging reduce and an increase in those seeking help. Working in partnership with the District Council, Police and Musicians Union to monitor and develop an appropriate policy and guidance on ‘Town Centre Busking’. Further developed the Business Toolbox on the BID Website. Actively engaged with the District Council and County Council to ensure town centre car parking prices did not increase. Spent a great deal of time working to address issues that have arisen as a result of the privatisation of the on-street parking enforcement. This included the deployment of Parking Angels at Christmas and we have since welcomed the introduction of Ringo – pay by phone. This work is on-going. Continued to support the Friends of the Pump Room Gardens on the successful Heritage Lottery Fund application to restore the Pump Room Gardens including the bandstand. This will see over one million pounds invested over five years, and the delivery of an enhanced ‘activity plan’ of events. Provided town planning / shop signage information and advice. Continued to work in partnerships with many town centre stakeholders to support project delivery. This included: The Chamber of Trade, Federation of Small Businesses, Warwickshire Police, The Shop Mobility Scheme, Leamington in Bloom, The Leamington History Group, The Leamington Society, Friends of the Pump Room Gardens, The Leamington Spa Town Council, the Coventry & Warwickshire Partnership, Community Arts Workshop and others. Represented businesses on the SME sub-group of the Coventry & Warwickshire Local Enterprise Partnership (LEP) and led on the proposal to have ‘retail sector’ representation at LEP Board level. This work involved liaison with DCLG and others. An active founding member of the Warwickshire Towns Network and key note speaker at the first annual conference. Provided bespoke support on issues such as business rates, planning and digital support to large and small businesses, and offered new businesses our ‘Business Launch Pack’ (available to anyone) which includes key business and media contacts, marketing tips, demographic information, launch event ideas and key contacts to invite. The 600 space Covent Garden Carpark redevelopment in the town centre will begin in May 2018. We have formed a ‘parking displacement strategy group’. The £1 million Heritage Lottery funded renovation of the Pump Room Gardens will begin in September 2017. BID is on the steering group. The District Council will announce a development partner for the Old Town Cultural Quarter imminently. Welcomed around 50 businesses to the ‘Spaghetti and Segways’ BID Business Meeting in July 2016 and the ‘#WDYT – Love Leam’ Business Meeting hosted in February 2017. This aimed to connect businesses, highlight opportunities to get involved, swap ideas and find out about local issues. Monitored antisocial behavior and begging and helped relaunch the ‘Think Before Your Give’ campaign. We work in partnership with the Warwickshire Police and numerous local charities to tackle the issue of people begging and shop lifting. Launched a strategic group to address issues around vacant units in partnership with Invest Warwickshire. Provided town planning / shop signage information and advice to approx 15 businesses. Welcomed 38 new businesses into the town throughout the year. Produced a ‘New Business Launch Pack’ (available to anyone) which includes key business and media contacts, marketing tips, demographic information and launch event ideas and key contacts to invite. Monitored town centre health using footfall and vacancy rate data in the town centre. The average vacancy rate in the BID area is 7% which is half the national average. Welcomed around 40 businesses at the ‘Love is in the Air’ Business Connect Meeting in March 2015. This aimed to connect businesses serving the wedding sector as part of the LoveLeam month. Relaunched the ‘Your Kindness Could Kill’ campaign in May 2015 in partnership with the Warwickshire Police and local charities to tackle the issue of people begging. This included public engagement, the production of posters and flyers as well as collection boxes in shops to provide an alternative place to give. Income collected is donated to the Salvation Army Way Ahead Project which supports homelessness in town. This is on-going. Actively engaged with the District Council and County Council to ensure town centre car parking prices did not increase. Worked to address issues that have arisen as a result of the privatisation of the on-street enforcement contract by the County Council. This is on-going. Supported the Friends of the Pump Room Gardens on the Heritage Lottery Fund application to restore the Pump Room Gardens including the bandstand. Developed successful partnerships with many town centre stakeholders to support project delivery. This included Warwickshire Police, The Shop Mobility Scheme, Leamington in Bloom, The Leamington History Group, The Leamington Society, Friends of the Pump Room Gardens, The Leamington Spa Town Council, the Coventry & Warwickshire Partnership, Community Arts Workshop and others. Welcomed 30 new businesses into the town throughout the year. Welcomed Ruth Waring as a guest speaker to two very popular business Open Meetings entitled ‘Business Connect’. Delivered a ‘Twitter & Linked in Skills’ workshop at our February Open Meeting. Provided Twitter & Social support to a number of local businesses. Delivered the ‘Your Kindness Could Kill’ campaign in partnership with the Warwickshire Police and local charities to tackle the issue of people begging. This included public engagement, the production of posters and flyers as well as collection boxes in shops to provide an alternative place to give. The first collection yielded £139.57 which was divided between the Salvation Army and the Siloam Christian Ministry who support homelessness in town. This is on-going. Helped a number of businesses save money on telecoms, energy and insurance through our partnership with Zone 4 Biz. Actively engaged with the District Council and County Council to ensure town centre car parking prices did not increase. This is on-going. Provided a town planning / shop signage information and advice service, as well as advice on Severn Trent Compensation. Monitored town centre health using footfall and vacancy rate data in the town centre. Developed successful partnerships with many stakeholders to support project delivery. This included Warwickshire Police, Severn Trent, The Shop Mobility Scheme, The Leamington History Group, The Leamington Spa Town Council, the Coventry & Warwickshire Partnership, Community Arts Workshop and others.